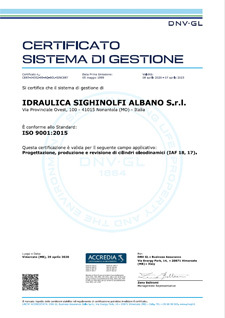 Idraulica Sighinolfi Albano believes in total quality, being certified ISO 9001 since 1998 and it puts customers’ satisfaction into the foreground, from the designing step to the final delivery, while monitoring the entire manufacture process with an accurate and constant check, made by our highly prepared staff, and analysing the data gathered. 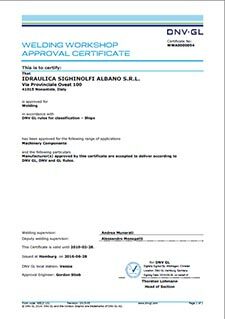 We manufacture hydraulic cylinders with welds certified by third parties, like LR or DNV-GL. If requested, we supply materials and heat treatment certificates (chemical and mechanical analysis) EN 10204 . 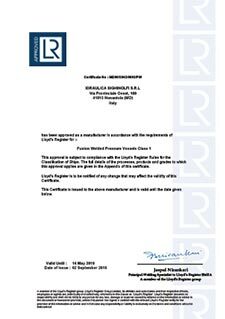 Our company can provide cylinders with 3.2 certification for each application you may need.